Founded on the principle, “we do a quality book on time,” Advantage Book Binding has been an industry leading trade bindery for over 35 years. While the book binding world has evolved recently, becoming greener and adapting to live alongside new technology, Advantage Book Binding has continued to meet the needs of new and old clients. Our book binding services range from large runs of law books to specialized limited edition art books, from trade manuals to New York Times bestselling hardback and paperback books, and so much more! Advantage Book Binding was founded in 1985 by Binding Industries Association (BIA) Hall of Famer Jerry Nocar, who quickly established an award-winning trade bindery. Under the current leadership, President Christopher Webbert has steered the company to be an industry leader, producing quality case binding, perfect binding, and mechanical binding products and custom books. These quality book products are delivered on time to clients both regional and national and both corporate and government. 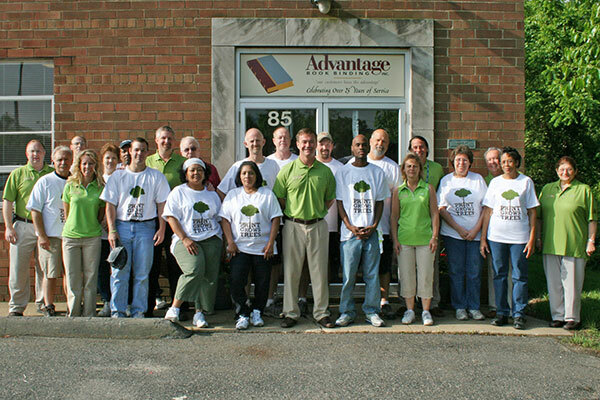 Advantage Book Binding has doubled in size, running two full shifts of highly skilled employees to meet customer needs and deadlines. Today, this family-owned industry leader is blazing new trails and breaking out of the box. Christopher, a BIA board member for 5 years and BIA President in 2014, has kept the company’s core philosophies while expanding industry limits for trade binderies. Having assembled a talented creative team with Brian Novotny as Vice President, Advantage Book Binding is pointing the industry towards the future while maintaining the lead in traditional book binding needs. Vice President Christine Webbert, taking advantage of the company’s flexibility to manage large orders for corporate or government clients as well as smaller runs for regional or custom orders, has pursued the beauty, versatility and practicality of book art and custom book design. Christine and Brian Novotny have teamed up to become the creative geniuses behind The Book Boutique, making and designing unique book art, self-published books, and custom books. These are created for a variety of individual and corporate clients seeking single volumes or limited edition runs of truly beautiful and lasting books. This expertise has led to an additional department that focuses on book and Bible repairs. Advantage Book Binding has partnered with Printing & Graphics Association Mid-Atlantic in launching the Print Grows Trees initiative to challenge the myths that have risen about the economic, environmental, and practical value of books. The paper and ink book industry supports the economic viability of tree farms, vital in combating the rising levels of carbon dioxide emissions. The bound book can be read again and again without sapping energy sources requiring fossil fuels. Advantage Book Binding works hard to make a product you can be proud of and that can be used and enjoyed for years. In 2018, the company has expanded to our new and larger 41,000 square foot facility to handle our growing market. With all of this industry experience and exciting innovation, is it any wonder that Advantage Book Binding is confident that our customers have the advantage!